I am embarrassed to admit how long this thing has been on the table. What started out as a fun project, soon became something we despised. I picked up this puzzle a few months ago. Nathan, being the turtle-lover that he is, was extremely excited about it, so a few weeks ago I finally decided to work on it. That’s right, a few weeks. I am normally not that bad when it comes to puzzles, but something about this one kicked my backside. I think it had something to do with the water-color look where all the pieces look the same. Remi’s midnight table slides didn’t exactly help either. I had to put several parts back together multiple times. Out of desperation, I recruited Rob to help me. We originally planned to finish it last night so we could finally have our dining table back, but we were unsuccessful. Tonight was Round 2. By the time we got about an 1/8 of the way from the end, we began simply finding pieces based solely on shape. It must have worked, because we finally finished the stinking thing. We immediately put a layer of glue on the top. There is no way we would ever voluntarily put this puzzle together again, so it will hang on Nathan’s wall. I am not normally a fan of gluing puzzles together, but this one was a HUGE exception. Now it is waaaaay past our bedtime and I am mere minutes away from today’s post deadline, but thank goodness that horrible puzzle is finally done!!! 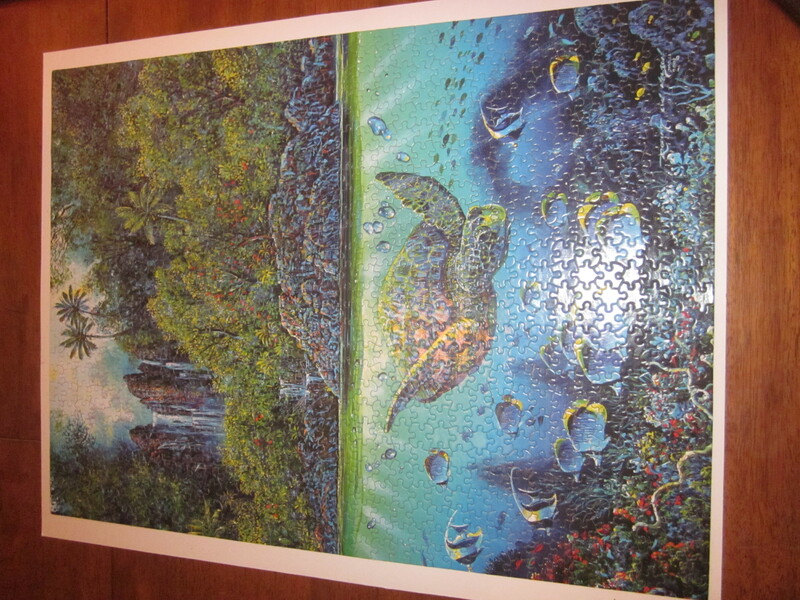 This entry was posted in Daily Life and tagged postaday2011, puzzles. Bookmark the permalink. I’ll bet Nate’s anxious to have this turtle hanging above his bed so he can look at it often. Good job!